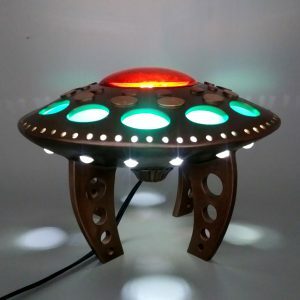 I have collected lamp parts for years meaning to make UFOS and the introduction of LED’s made them possible. The base is spray painted ceramic. Other materials include marbles, small LEDS, glass lenses, glass shades, acetate paper, paint, gold leaf, wire, nuts, golf tees … basically anything that attracts my interest. Each one is different and as some of the glass is vintage they are not always perfect.